Whether you want to take better everyday photos with that smartphone, or you have a nice new DSLR camera that you’re dabbling with, this interactive online workshop will put you on the path to better photos. In six weeks, you’ll learn to master the rules of composition, make the most of available light, and get more out of your equipment—no matter what kind of camera you’re using. Would you like to feel more confident in your photo-taking abilities? To find beauty in everyday objects, and see attributes of people you’ve never noticed before? 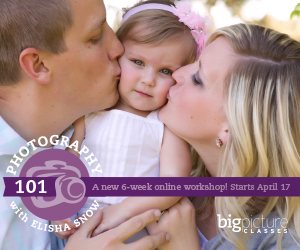 Photography 101 with Elisha Snow will teach you to look at light, shadow, shape, and color differently, and most importantly, to develop a passion for preserving the beauty that surrounds you.